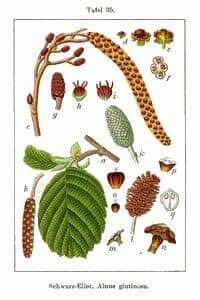 Black Alder (Alnus glutinosa) is generally a small tree or bush. It is a magnificent colonizer and is often used to reclaim poor, humid or unhealthy soils; as a matter of fact, its roots carry out nitrogen-fixation. Its wood is very resistant to water: Venice is mostly entirely built on foundations made of alder poles, taken from the woods of Cadore, Istria, Carnia and from the Venetian and Friulian Prealps.